Competitive games leave the majority of the players feeling left out or upset. When players are mismatched in skill, certain kids have the advantage making it difficult to set up a fair game. Noncompetitive games create a sense of unity, cooperation and support. The games allow all kids to participate the entire time without branding some as winners and others as losers. Icebreaker games focus more on getting acquainted with one another than winning. These games work well at the beginning of the school year or in a group where not all kids know each other. Try an ordering game where the kids organize themselves in order based on a particular trait, such as birth date or alphabetical names. Another idea is to stand in a circle with a ball of string. Hold the end of the string and toss the ball to another person. Ask the person a question about herself. After she answers, she holds onto that point on the string and tosses the ball to another person. You eventually end up with a web connected between all of the kids as you learn more about others. Cooperative games ask the players to work together to complete a specific task. The activity could be completed with partners, small groups or one large group. The human knot is an example. The participants stand in a close circle and grab hands with two other people. The game won't work if players hold both hands with the same person. The goal is to untangle the knot you create by holding hands without breaking contact with one another. Scavenger hunts and treasure hunts that require the kids to work together as a team are another idea. Dramatic games give kids a chance to express themselves creatively without a competitive tone. These games focus more on the entertainment and expression value of the activity. One idea is to call out an animal or other object and have the kids imitate it with their bodies. For example, to imitate a bird the kids might run around and flap their arms while chirping. Charades is another dramatic game option for kids. Many classic music games involve elimination, which promotes competition. To eliminate the competition, simply allow everyone to stay in the game until the end. Play freeze dance and let the kids dance around while music plays. When the music stops, the kids freeze. The game typically eliminates any kids who move after the music stops, but you can omit this rule to keep everyone in the game. 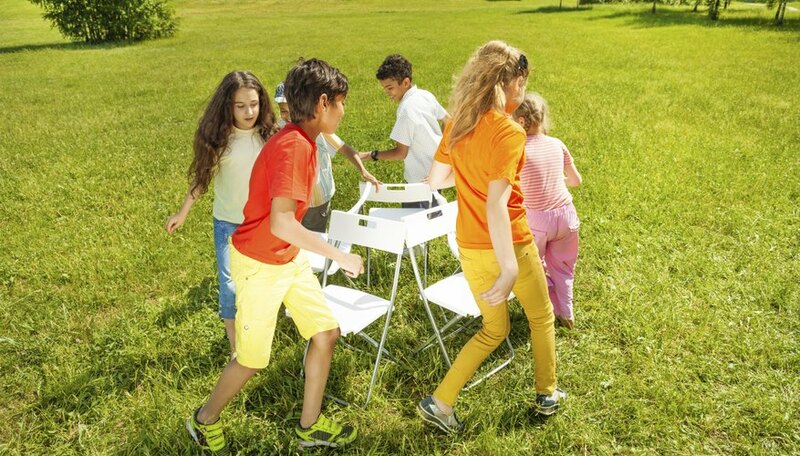 To make musical chairs less competitive, use hula hoops instead of chairs. Remove one hula hoop each time. Instead of being eliminated, the kids have to squeeze into hula hoops together. When only one hula hoop is left, the kids will have to stand very close to all fit inside the hoop.